If healthy, Dustin Pedroia (right) is the best candidate to have a bounce-back, All-Star kind of season in 2015. 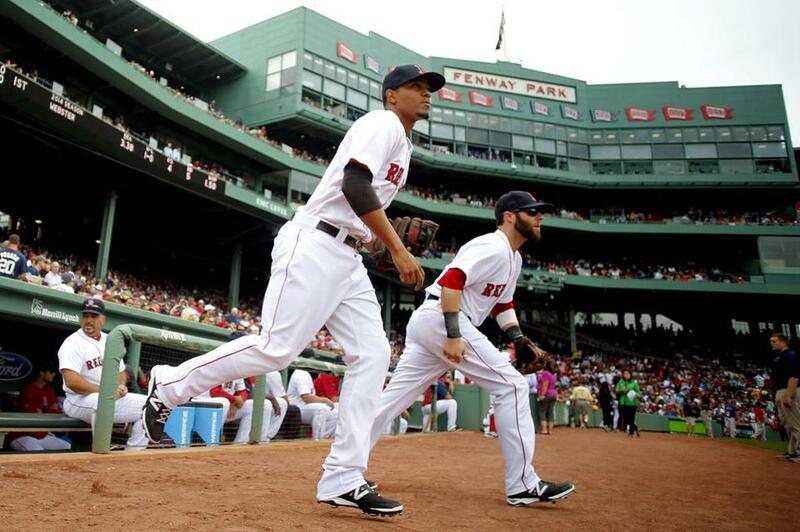 Xander Bogaerts should line up and stay at shortstop. Plenty will happen with the Red Sox over the course of the next five months as Ben Cherington tries to build a last-place roster into a first-place one for the second time in his tenure as general manager. The Sox have bountiful trade chips and only a handful of truly untouchable players in the majors and minors. Outside of David Ortiz and Dustin Pedroia, anybody could be moved for the right return. James Shields: Forget Jon Lester, the Red Sox made it clear when they traded him that they don’t intend to pay him what he is worth. In Shields, who turns 33 in December, the Red Sox can get a reliable starter for a shorter-term deal. Look for them to overpay on the average annual value to get a three-year deal. Trade Mookie Betts and Henry Owens for Johnny Cueto of the Reds. He is 12-5, 2.48 in 23 interleague games and a legit stud. The Red Sox are in desperate need of a top-flight starter and Cueto fills that need. Justin Masterson: The team’s collective confidence (or is that hubris?) will convince them they can fix Masterson, who has a 5.97 ERA this season. Masterson once worked with John Farrell when he was a Sox prospect, after all. Masterson is not a bad gamble for the right deal; he could turn into the next Phil Hughes. Clay Buchholz: Buchholz has the ability to be a No. 1 or a No. 2. But he has yet to make more than 29 starts in a season. Until he shows he can stay off the disabled list for a full season, it’s impossible to trust Buchholz in a higher spot. Joe Kelly: He could prove to be the best pickup of the 2014 trade deadline. Kelly has prime-time stuff and needs only experience and more gamesmanship to refine it. Rubby De La Rosa: For now, he is the choice. But it could well be Allen Webster. Or Henry Owens in June. Or Eduardo Rodriguez in July. Or Brian Johnson in August. Or one of the other in-house guys. Matt Barnes and Anthony Ranaudo will get looks. Andrew Miller: The Red Sox still seem to want Koji Uehara to return. The question is whether Koji Uehara wants that. He has consistently said he will evaluate all options. Uehara is on the downside of his career and was worked hard the last two seasons. The Sox should be bold and bring Miller back. They worked hard to rebuild his career and should reap the benefits. Tommy Layne: You’re forgiven for not paying attention. But this guy has been dominant since coming up in July. Lefty hitters are 5 for 42 against him. Junichi Tazawa: He has been used a ton the last two seasons but seems to be holding up well. Theoretically, he could close but doesn’t seem to want the job. Brandon Workman: This seems to be the best role for him. His stuff plays up in relief. Edward Mujica: He’s signed for 2015 and presumably has a job. Throw Steven Wright in the mix here along with others. Christian Vazquez: The Red Sox are willing to live with his offensive shortcomings (which will lessen over time) because he shuts down running games and frames pitches like a Molina. They’re right to think that way. David Ortiz: There are few dedicated DHs in the game and Ortiz remains the best. He hits for power, gets on base and is a clubhouse leader. Enjoy it while it lasts. Mike Napoli: He is signed for 2015 and will improve once he doesn’t have a crooked finger on his left hand. Bet we hear shortly after the season that he had surgery. Dustin Pedroia: He is the best candidate to have a bounce-back, All-Star, fifth-in-the-MVP-voting kind of season. Pedroia has played with a mangled left hand the better part of the last two seasons and that has crippled him as a hitter, at least in terms of power. If healthy, he can return to form. The question is whether he’ll be able to restrain himself from sliding headfirst into first base or diving after groundballs 25 feet away. We all admire the hustle but the Red Sox want to see more self-preservation and production. Xander Bogaerts: Start him there and leave him there. Stop messing around with this kid. Pablo Sandoval: The Red Sox need power, a third baseman and somebody who can hit lefthanded. The Panda checks all the boxes. Maybe you sell yourself in the idea by thinking he can DH down the road. Allen Craig: Not crazy about this idea but what else are the Red Sox going to do with him? They can only hope he heals up and becomes the offensive monster he was with the Cardinals from 2011-13. Left field should be safe enough, the ball can only go so far. Rusney Castillo: The Sox need Castillo to be good right away given all they invested. But eventually a high-priced free agent from Cuba is going to stink. It’s a matter of time. Yoenis Cespedes: He’s a trade candidate for sure, especially if the Sox decide they want to keep Betts. Right field plays to his arm but he’ll get lost chasing some balls, too. David Ross: He still makes sense given the lack of attractive options on the market. But the Sox could always trade for somebody like John Jaso. Shane Victorino: Coming off back surgery, this may be his best role. Start him three times a week at different spots. Brock Holt: His second-half dive probably cost him a shot at being the third baseman. But he’ll get plenty of at-bats backing up different spots. Being a lefty bat helps. Follow Peter Abraham on Twitter @PeteAbe.